Modern house designs are all over the spectrum in terms of shapes, sizes, and materials as architects seek creative solutions for every problem presented by location, client’s desires, and, of course, budget. While modern homes are generally quite alike with their boxy shapes and glazed facades there are still a lot of interesting eye-catchy ideas out there. When talking about a modern house it’s hard to avoid glass facades. The idea is to create an indoor/outdoor feel that is so important for popular mid-century modern Eichler and similar houses. Even if facades aren’t made of glass, big windows become an essential part of most modern homes. 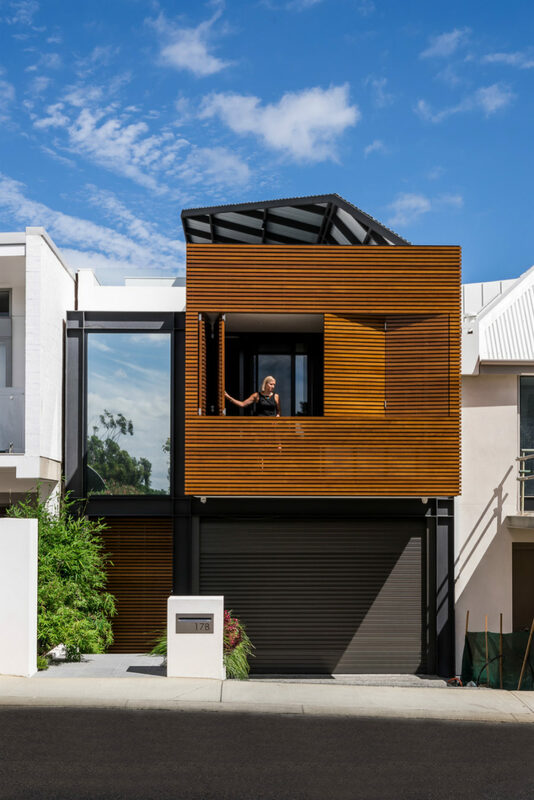 Designed by Michael Hennessey Architecture this boxy residence with a glass facade is styled minimally to amplify natural light and open up to the park views. Sitting on top of a garage the two-storey building houses living spaces on the first floor and three bedrooms on the second. Since its back also features glazed walls the living area has a continuous flow of natural light as well as views. Davidov Partners Architects‘ LSD Residence looks representative of modern house design. 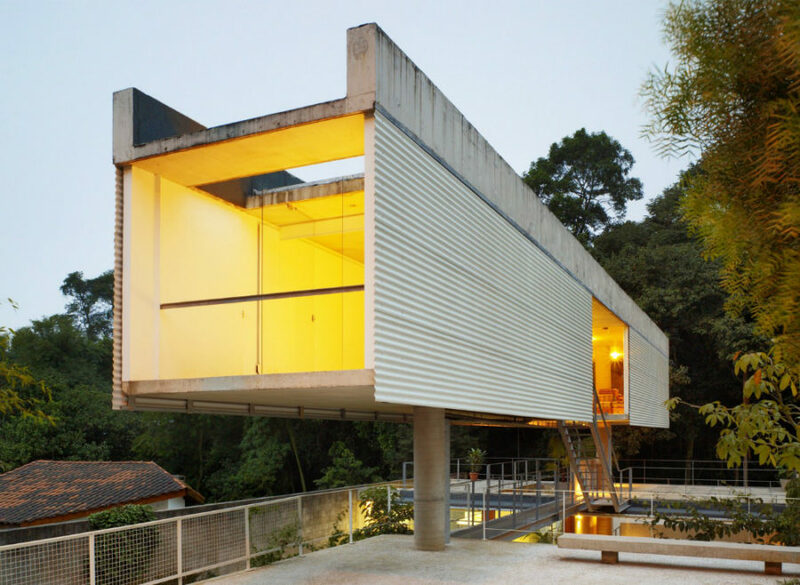 Its concrete walls house glass cubicles filled with living spaces. Barely visible blinds allow for privacy as does an interrupted fence surrounding the property. Stylish and minimal the interiors occupy 4,305 square feet (200 sq m) providing everything a mature couple needs and then some. A great example of a modern house is the Un Patio House by Polidura + Talhouk Arquitectos. Created out of two stacked blocks for public and private areas the concrete building has simple shapes and a glass facade. 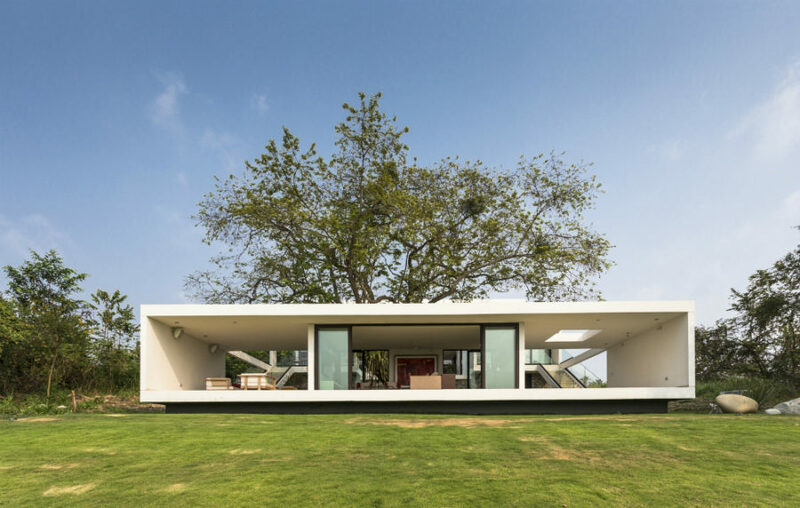 Since the top block sits on two parallel walls that also act as a fence, it creates a covered pavilion where the living room and courtyard were located. 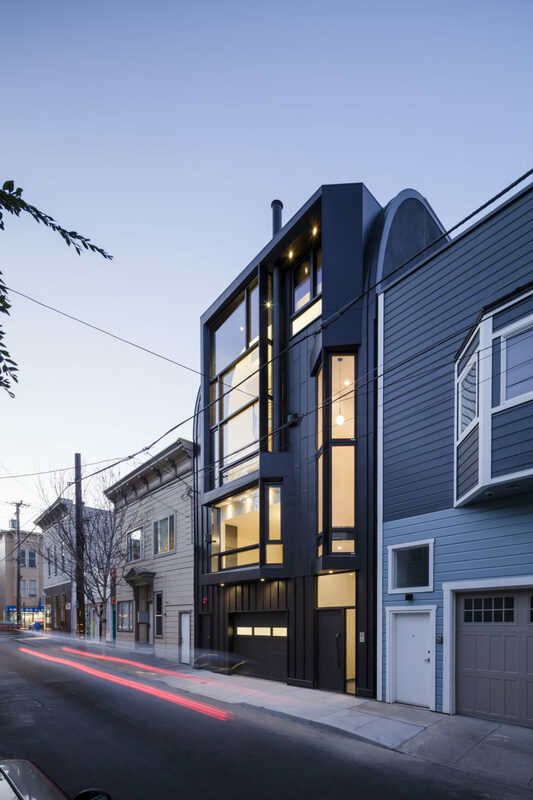 Looking like a spaceship cabin Alan Voo House by Neil M. Denari Architects is actually a 1,000-square-foot (92.9 sq m) extension to an existing home. Its ground floor is almost entirely outlined with glazed walls while the top floor opens up to a green location with huge glass inclusions. 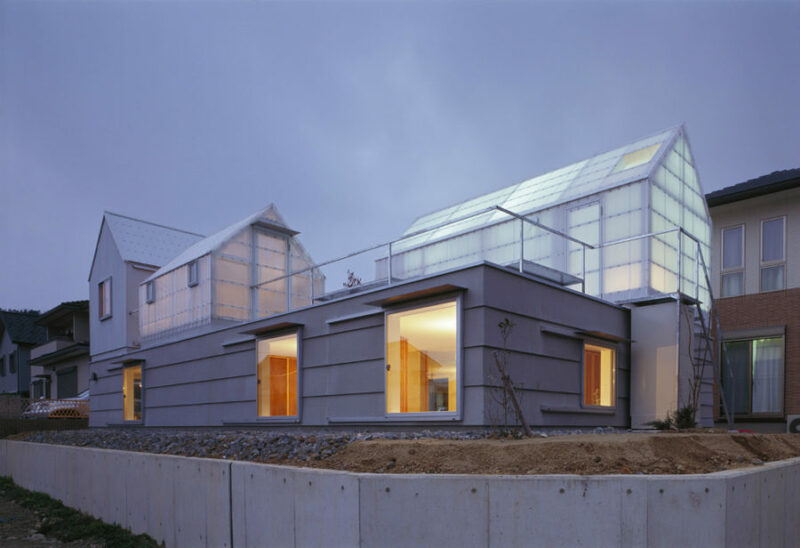 The house immediately catches the eye because of its futuristic shape, but it seems like the facade faces the backyard hiding the lower glass box ground from privy eyes. 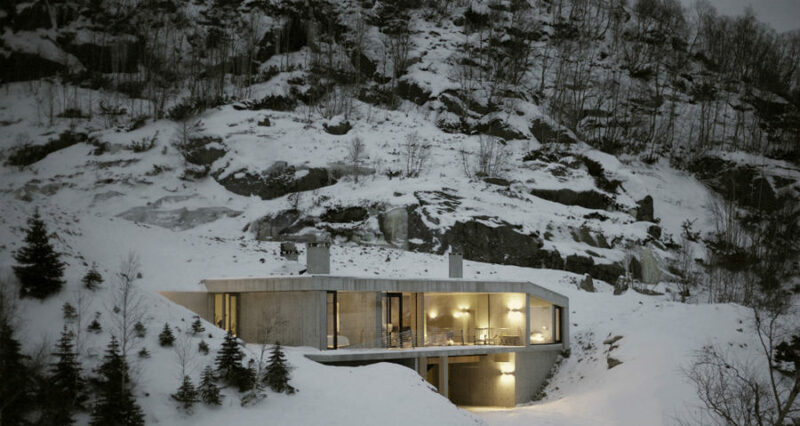 Located in a steep terrain of Sirdal in Norway this modern house by Filter Arkitekter was made to blend with its environment. The architects chose concrete because of its staining properties. With time, they are confident, it will be covered with moss disguising most of the structure as part of natural landscape. Featuring a glass facade the house was insulated using glass-master and adhesion details to avoid frames and sills that aren’t good for keeping temperatures stable within the house. Ayutt and Associates design have built an incredible modern house in Thailand with contemporary interiors and gorgeous architecture. Combining different colors and materials house’s glass facade doesn’t look as plain. A beautiful monochromatic blue pool in the courtyard only amplifies the airiness of the house. Inside, smaller inner courtyards with trees and river rocks decorate the house echoing beautiful Thailand nature. 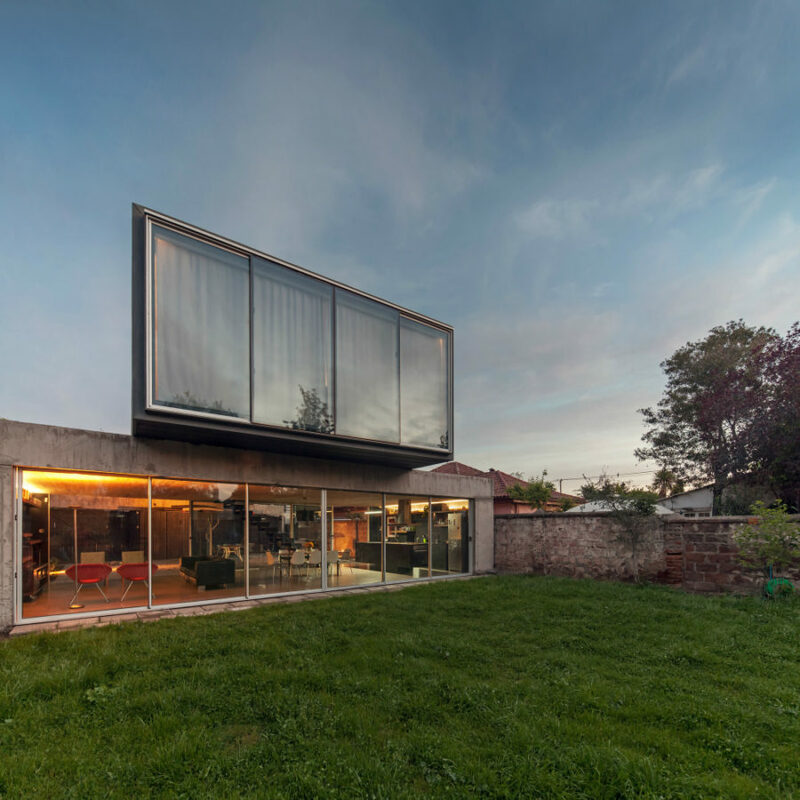 Located in Madrid it’s easy to see why the Aluminum House features so much glass. Surrounded with gardens and overlooking a huge swimming pool the building has to have a strong connection with the outdoors. It certainly has plenty of privacy too where it’s needed, but the minimal design works so well with numerous glass inclusions. 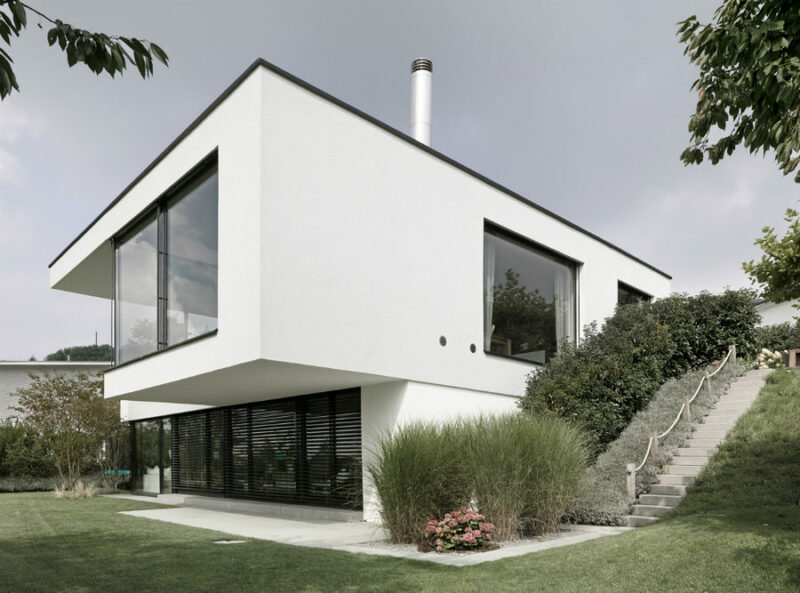 This modern house Objekt 254 by Meier Architekten in Switzerland. Following the latest contemporary trends it combines black and white in its exterior along with clean lines and minimal details. On the ground floor floor-to-ceiling windows are protected with blinds while the windows on the top floor employ majestic long curtains for increasing privacy. 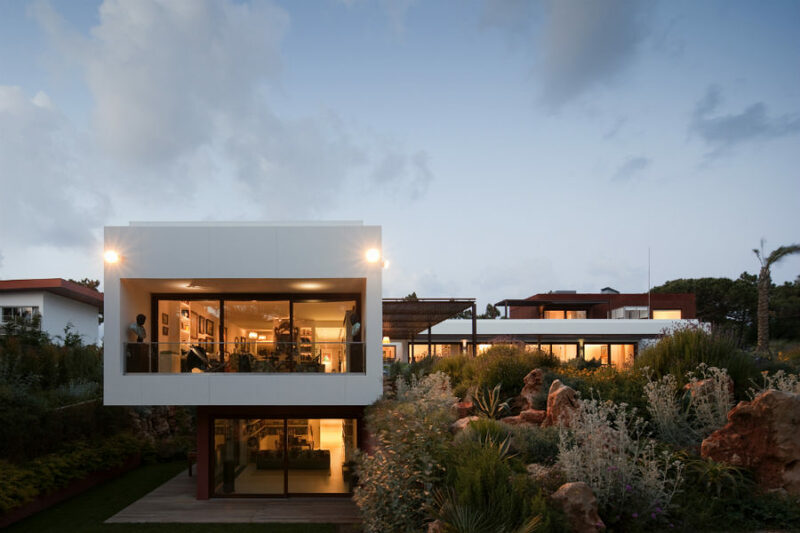 Fragmentos de Arquitectura built the House Quinta Da Marinha in an L shape enhanced with floor-to-ceiling windows. Encase in white and rusty red the house enjoys both privacy and environing views. 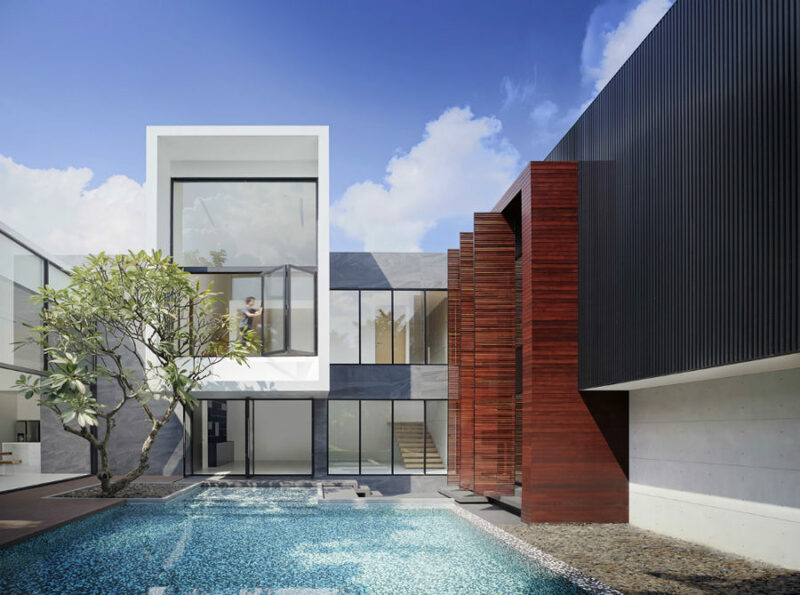 House’s shape allows to keep outdoor spaces like patios and a beach entry pool in privacy. In addition a rock garden surrounding the spaces further promotes the sense of seclusion from the street. Screens are great at not only increasing privacy of a modern house but also adding a decorative element to the often minimal interiors. Decorative screens light up at night providing an additional design element to a house. Built in 2010 PDR 385 is a great example of how screens can be used to add contrast to a modern house. Sprawled across 6,458 square feet (600 sq m) the house features huge windows and a mezzanine in between residential rooms. Echoing facade screens the ground floor is covered with wider wooden slats to increase privacy in the areas like kitchen and washroom. This Auckland modern house by Pattersons is something else when it comes to modern architecture. 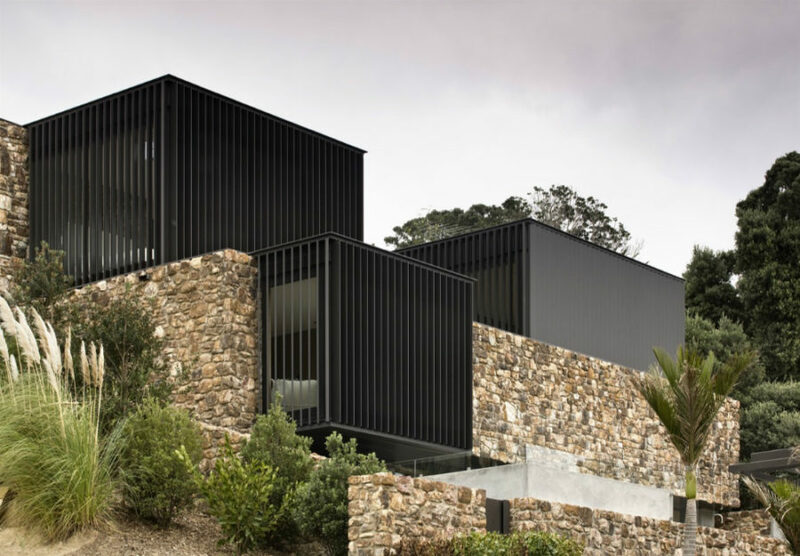 Built with the local pyrite rock the house is comprised of black screened boxes lodged between its structural elements. 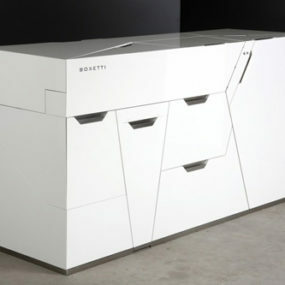 Its unusual form creates multiple levels of living space occupying 4,251 square feet (395 sq m). In the backyard the swimming pool is too finished with pyrite echoing the exterior and creating a coherent picture. 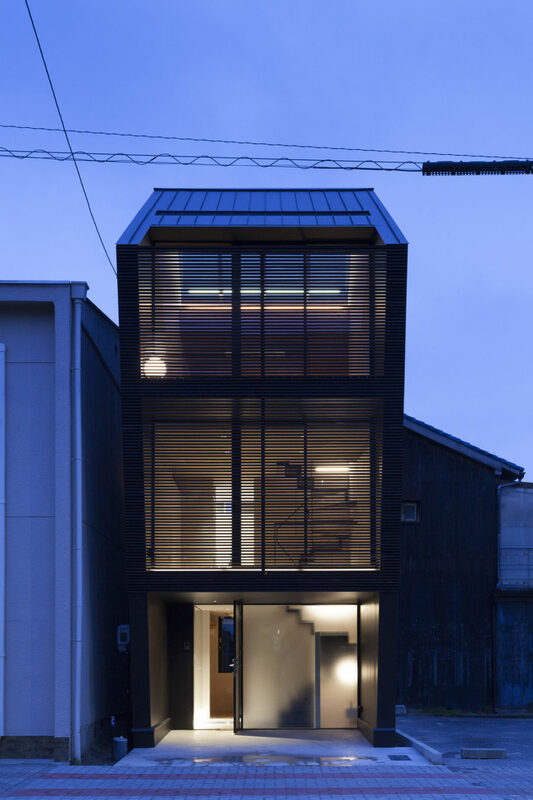 Slice of the City by Alphaville Architects is a box-like house in Japan that is practically fully enclosed. The windows cut inside the structure rather than facing outwards. Thanks to the roof access there’s an outdoor lounge area in middle of the city that residents can enjoy when they don’t want to cocoon inside. Another recent project from Japan is by Takuro Yamamoto. Intent on providing a spacious outdoor terrace, again in the middle of an urban space, the architects have divided the house into two blocks. One is filled with living spaces while the other is completely open. On the ground floor the open space can probably double as a car port. And the upper terrace has a visual communication with the interiors through windows. 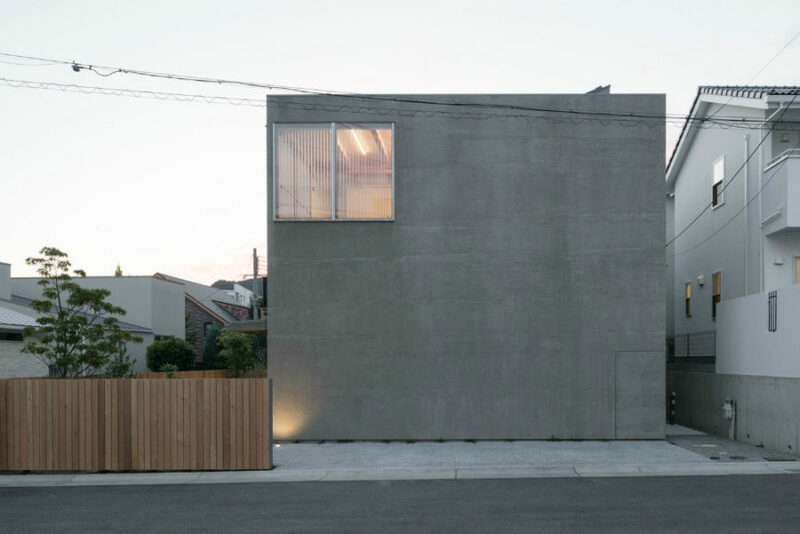 Yet another boxy building is Y7-house by Masahiko Sato. Designed to be as minimal as not to upset the surrounding natural landscapes the house consists of two blocks that include living areas and a garage. One of the parts appears to be levitating above the hill, on which the house stands. This was done to avoid the destruction of the natural plot. 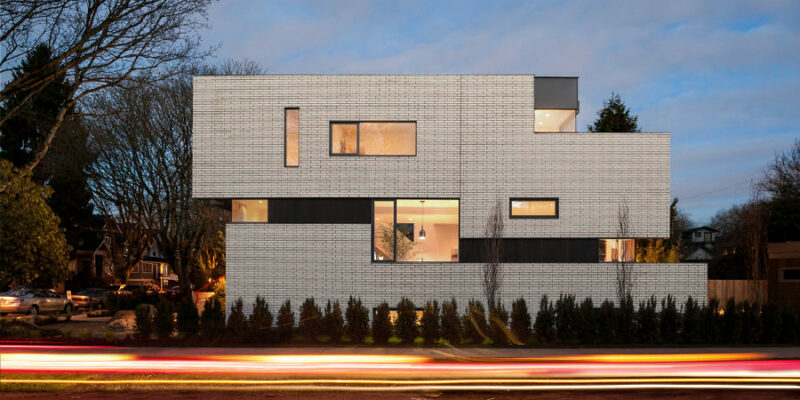 Located in Vancouver this modern house by Randy Bens Architect is a perfect alignment of the two Tetris figures. Ca you see them? Decorated with white brick and dark cedar the facade has a few windows and transoms to bring more light into the open plan interior. Well-disguised from the street side the house includes a master suite’s roof deck and a nice waterless rock landscape in the backyard. 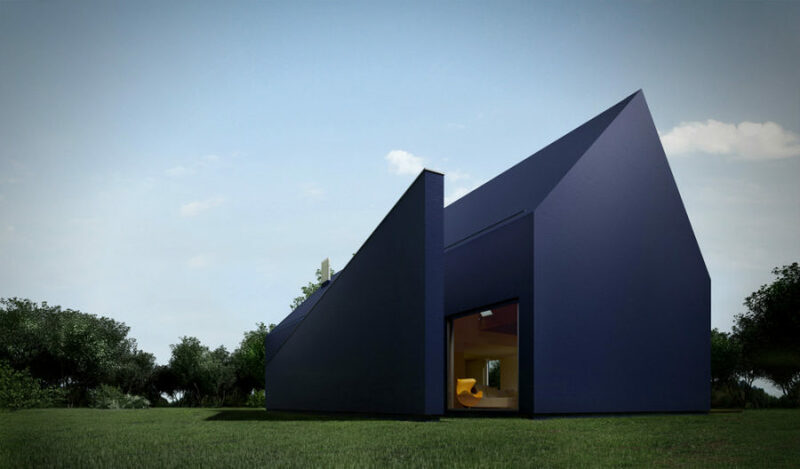 Box House II by Massive Order fully deserves its name. Though designed with functionality in mind the house has a lot of glass and other elements that connect it with the outdoors. Luxurious interiors boast contemporary materials and only a few elements and accents allude to the traditional style. 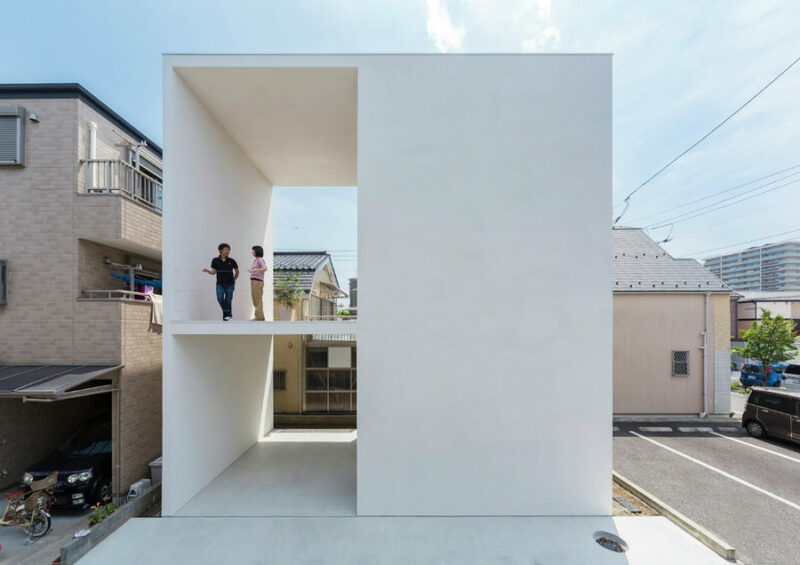 Tsubasa Iwahashi Architects take the box shape back to its basic appearance stripping away all detail. With a minimal facade and a single second-floor window the concrete house is supposed to create a sense of distance between each and every object in space. Out the back the house opens up a little with a few more glass inclusions, but the plot fenced in a C shape provides more privacy to the enclosed dwelling. 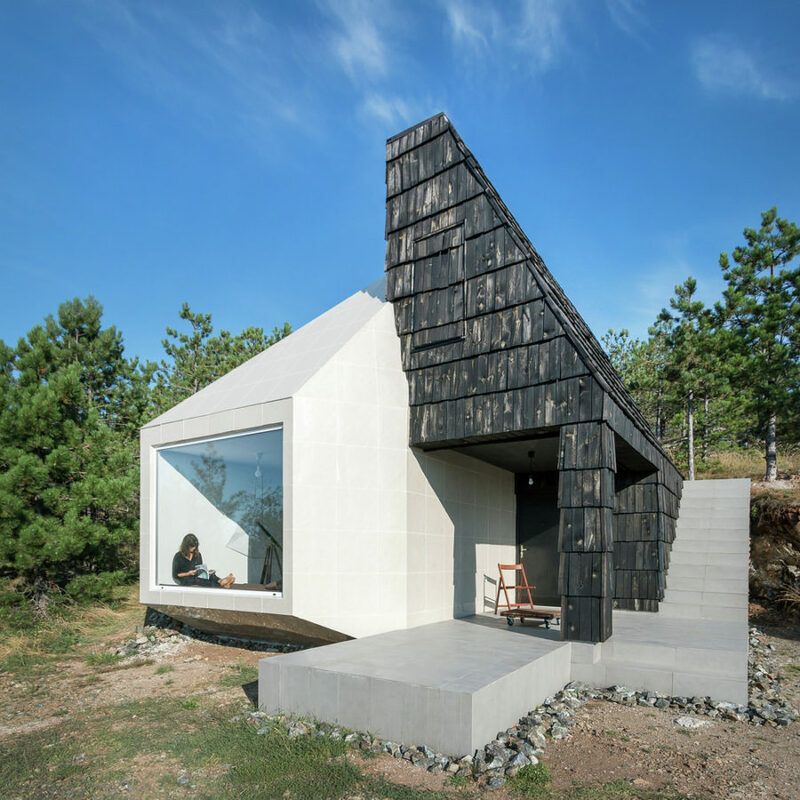 This South Korean house by UTAA has an interesting look about it. 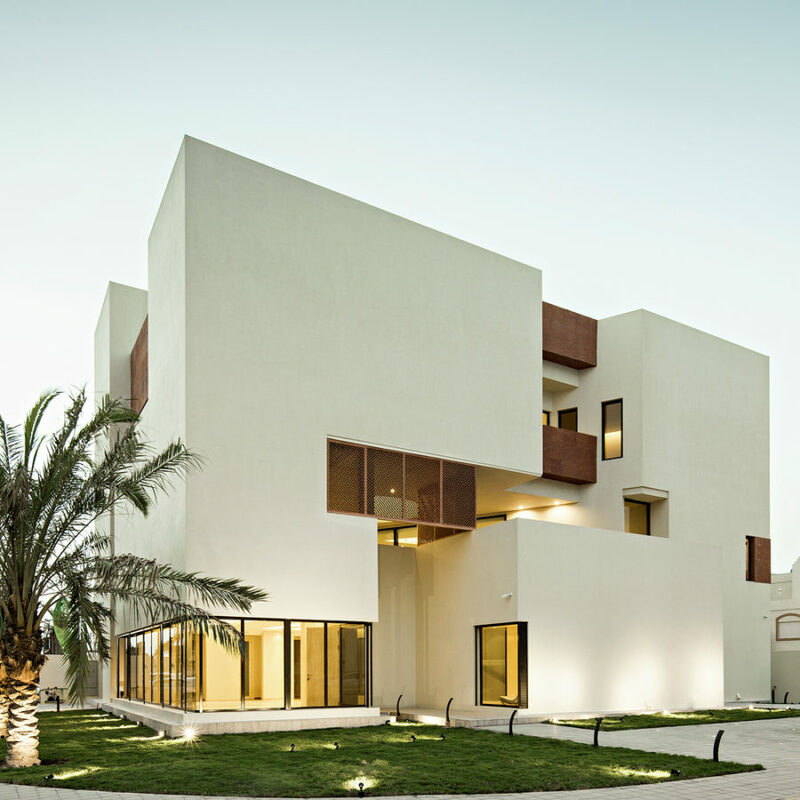 With its complex planning based on an uneven plot and the client’s specific needs the building turned out looking quite atypical. Pulled inside for more comfort and privacy the house facade has multiple big and small windows as well as sliding glass door entrances. Balancing between the tasks of bringing in natural light and keeping the living and working quarters separate the architects managed to also make this modern house look intriguing. Angelo Bucci and Alvaro Puntoni have designed a house in Carapicuiba, São Paulo that sits in a depression not visible from the street. Its shipping container-like top floor is connected with the main building with stairs and bridges. Thanks to its hidden positioning the house can enjoy lots of glass walls that stay hidden from privy eyes. 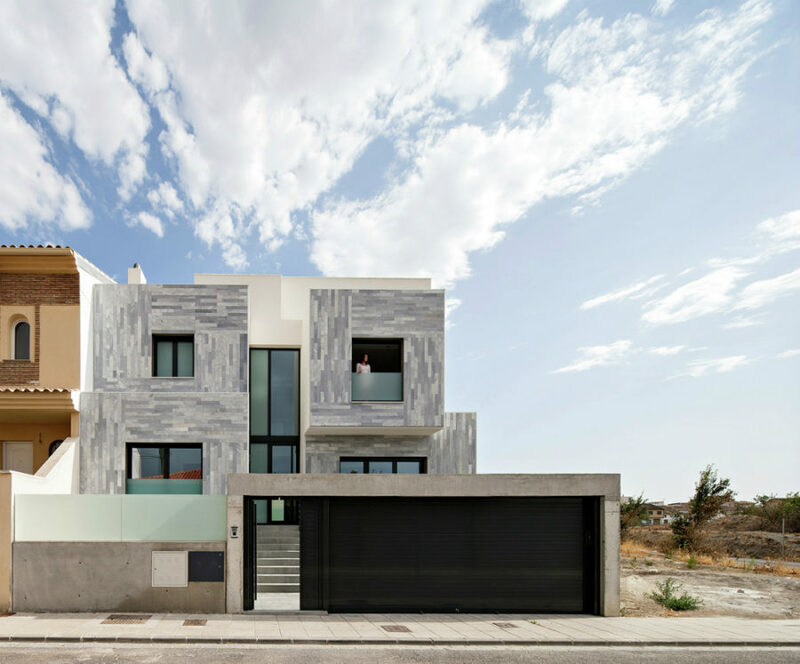 Looking unconventional with its monochromatic facade the A&N House by ariasrecalde is truly a piece of art. Its complex design accommodates the needs and desires of the clients. And the finishing touches like frosted glass windows make for an interesting modern design concept. Pitched roof houses are not only traditional but they are a symbolic representation of a living space. Sure, today houses look completely different, but some architects are still trying to do their own modern take on the classic shape. moomoo Architects built the L House in the Polish city of Łódź back in 2008. Covering it with an insulating plastic material Thermopian the architects kept the exterior extremely enclosed. A few skylights, windows and sliding glass doors allow to take advantage of natural lighting while the angular fence shields the opposite side of the house from anyone who wanders close. 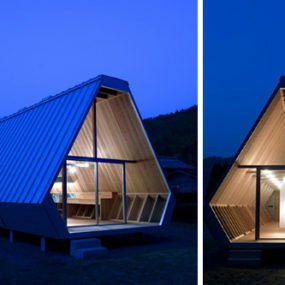 Hiroki Tominaga-Atelier have rebuilt this house in Gifu Prefecture in Japan for an elderly couple. 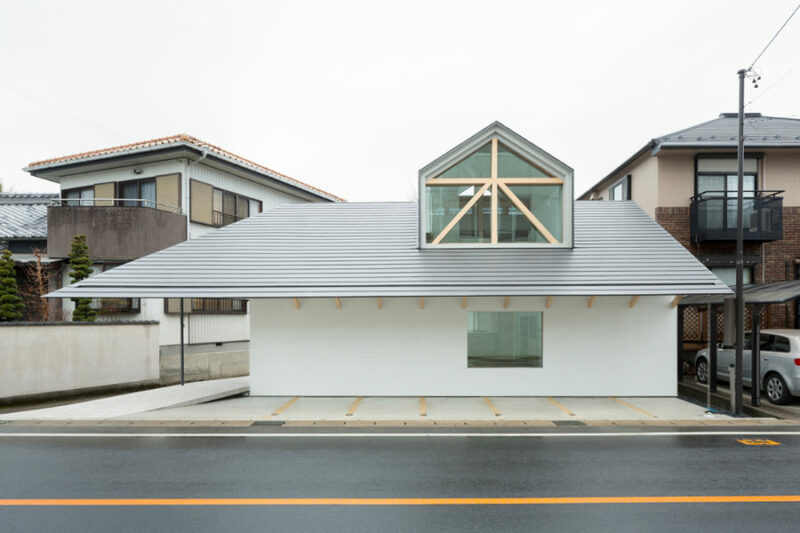 Combining both traditionally Japanese and European architectural elements the architects made sure the house gets enough sunlight all the while being removed from the edge of the road. The house’s interiors are as minimal and light as its exterior. In the back it hides a small inner courtyard tucked away from the busy streets as well as fenced from neighbors. Intriguingly named Dr. House this Scapelab project has an ambiguous shape that appears to be distorted. 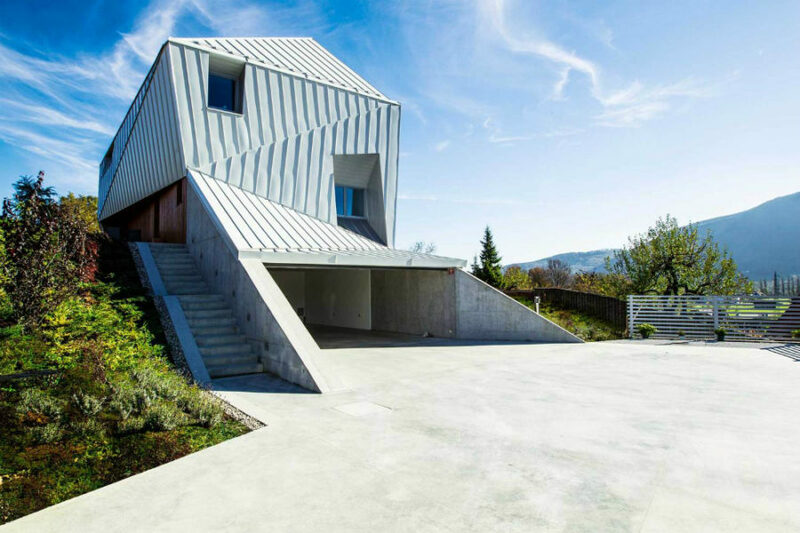 Located on the green hills of Slovenia the house built for the real local doctor certainly stands out with its metallic silhouette. The house opens up to the outdoors with sliding glass doors. This allows the open plan living areas extend to the outdoor wooden terrace from which the residents can enjoy the gorgeous views of the locale. MacKay-Lyons Sweetapple Architects‘s Enough House in Canada looks very traditional with its pitched roof and a chimney. Built for the firm’s architect intern the house that shares a plot with a 1830’s schoolhouse looks similar to the historic building. While its exterior is clad in a rusty metal paneling, on the inside the wood dominates because of its affordability. A glazed living area opens up to a nearby pond and a country dirt road with miles and miles of pastures going in all directions. 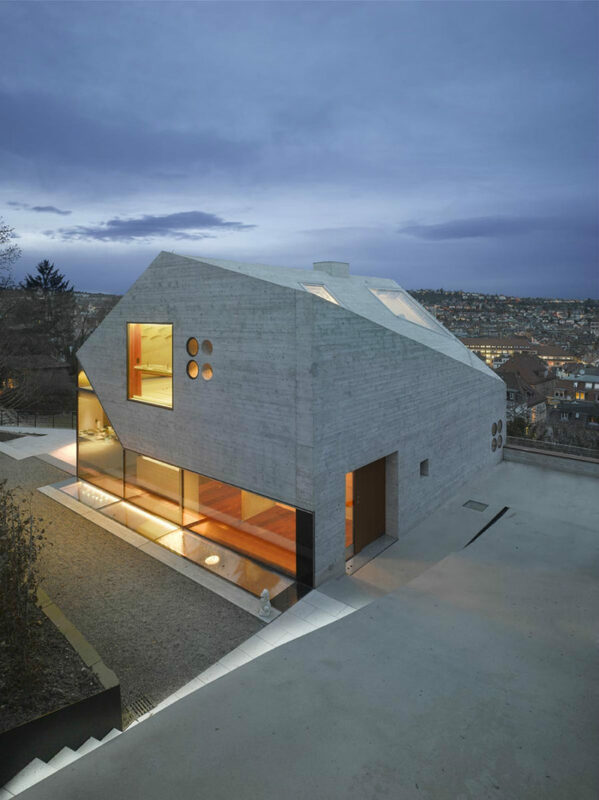 House 36 by Matthias Bauer Associates in Stuttgart is a peculiar building with a pitched roof, but it’s far from looking conventional. Overlooking the city the house was built in a shape of some kind of a mountain crystal combining lots of angles made in concrete and glass. Its glazed ground floor and big skylights along with round openings here and there balance privacy and lighting. And its wooden interiors make it more inviting and homely. Lo Contador House renovated by GNP Arquitectos is 60% a completely new structure. It may resemble the classic house shape with its pitched roof but the entire approach and execution are modern. It’s not hard to see the original ground floor structure, but it might have as well been a totally new project. There is virtually no trace of traditional style left. The Eyelid House presented a lot of challenges to Fiona Winzar Architects. 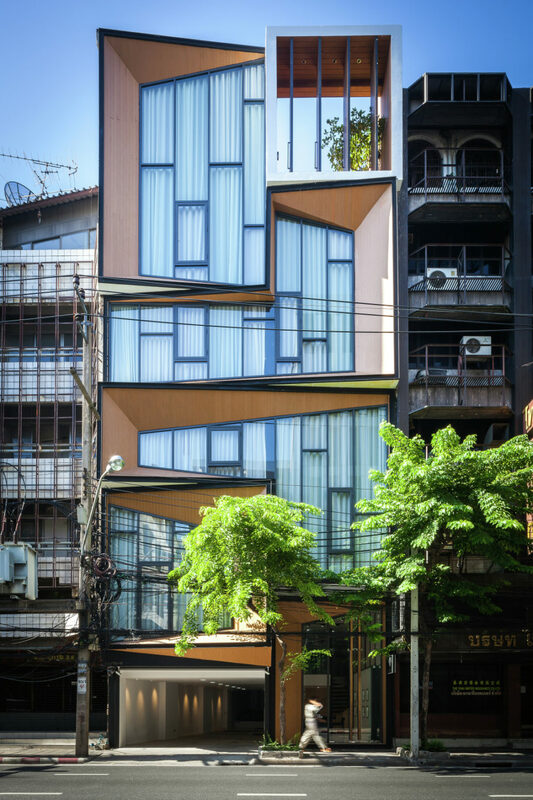 The extremely tight plot bordering a three-storey hotel called for really creative design solutions. Using roof overhangs and clever positioning the architect managed to create a modern house that is not only practical for a family of five but also has an interesting aesthetic. Although its roof pitch is moved to the side the structure somewhat resembles the traditional house shape. 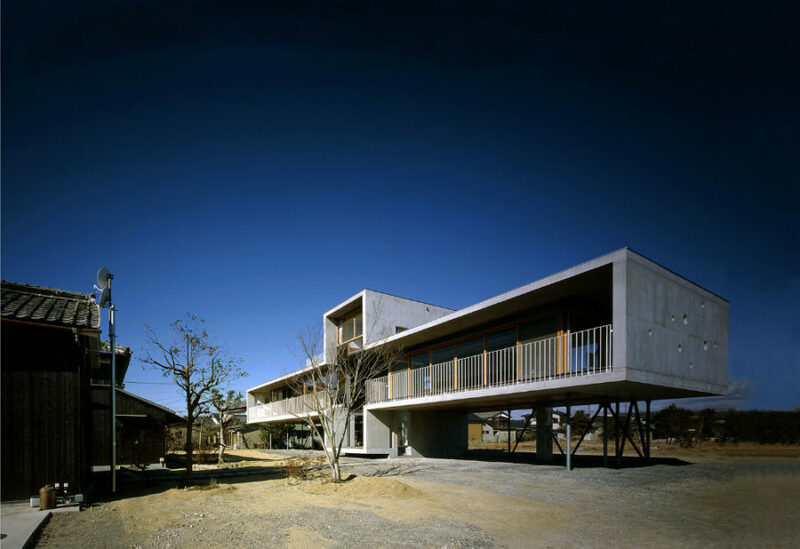 Another modern Japanese house is a project from the creatives at Tato Architects. 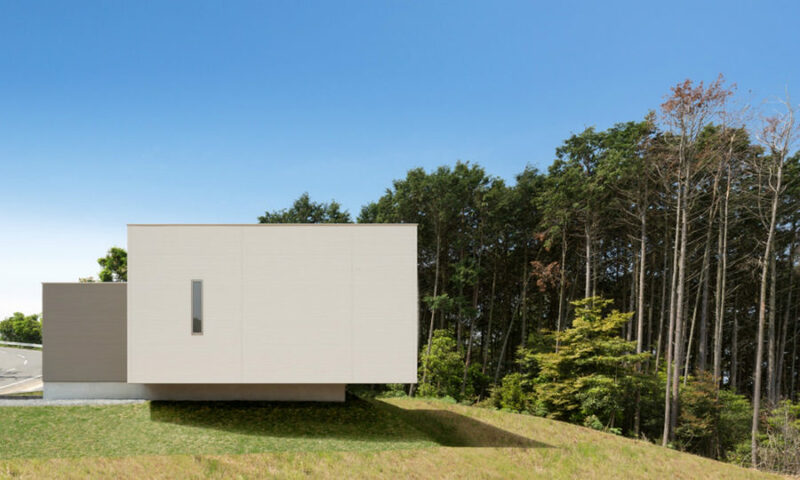 Located in Hyogo Prefecture where the sky is often overcast the architect wanted to make the house as light as possible. To do that he built three house-like sheds on top of a rectangular foundation to accommodate a bedroom, a guesthouse, and a bathroom. All can be accessed from the inside through stairs and ladders. Interestingly, their light material allows natural light to travel in and out depending on time of day. Modern house designs built with wood are still quite welcoming, but have a totally different aesthetic. Often shaped as barns and boxes they offer a quite peculiar charm. 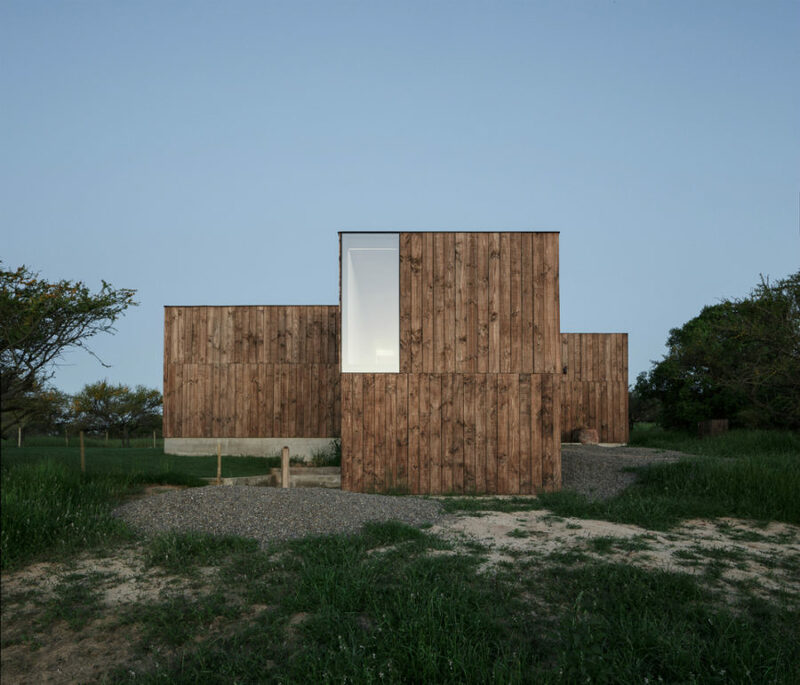 CML House by Ricardo Torrejón and Arturo Chadwick is one of those that looks like a hybrid between a barn and a box. Textured wood allows it to blend a bit with its natural locale. And the metal-framed windows create a communication with the green outdoors. On the inside the house is too clad with wood creating an inviting and warm atmosphere. Both the shape and material make for a very unconventional look. 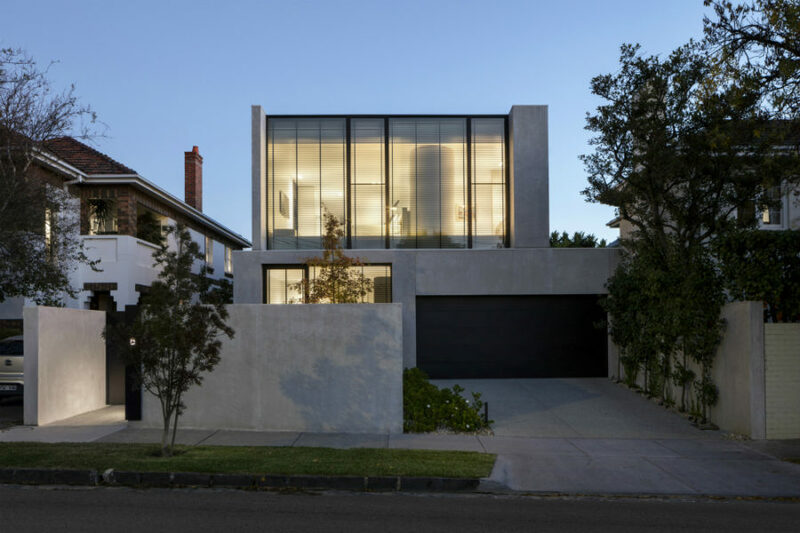 Claremont Residence is a house for a modern dweller with a busy lifestyle. Keen Architecture designed it to take advantage of the plot as well as the views. The result is a very private abode with a core that has access to the outdoors outfitted to entertain guests. 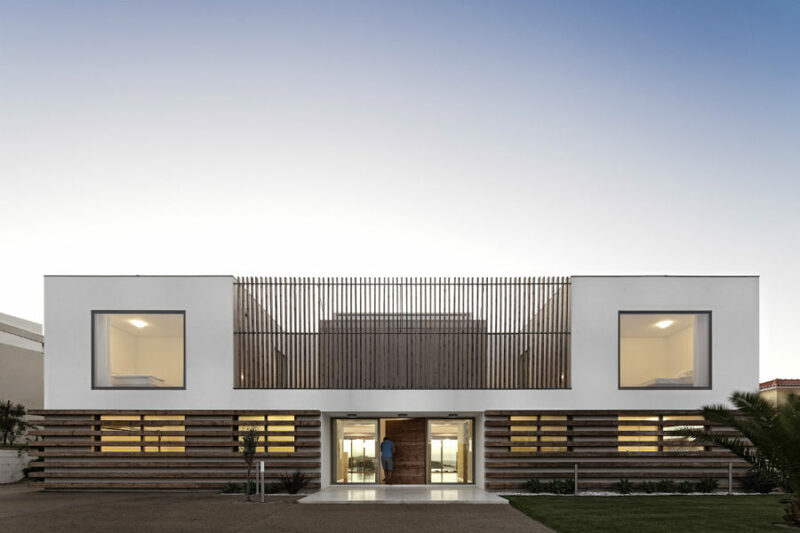 Its modern steel-framed facade is hidden behind a louvre system with wooden shutters, all of which makes it stand out from the white neighboring homes. 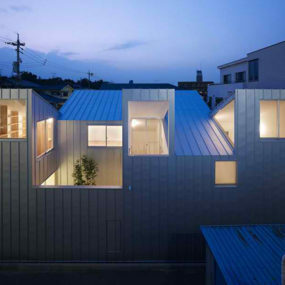 Japan offers yet another modern house design by Onishimaki + Hyakudayuki Architects. Located in a neighborhood filled with wooden houses the architects came up with an interesting facade wrapped in wooden blocks. Contrasting with its white core where the living spaces are located the dominant wooden element offers terrace spaces and walking stairs. This modern house designed by the creative people of EXE studio is truly exceptional. Combining light and dark materials the architects accentuated the contrast between the modern (light) and traditional (dark) styles. This was also done to insert the house into the rocky environment. The result is unexpected and quite intriguing considering its size. Modern wooden houses are a far cry from the cute country huts that mind may associate with a phrase ‘wooden house’. 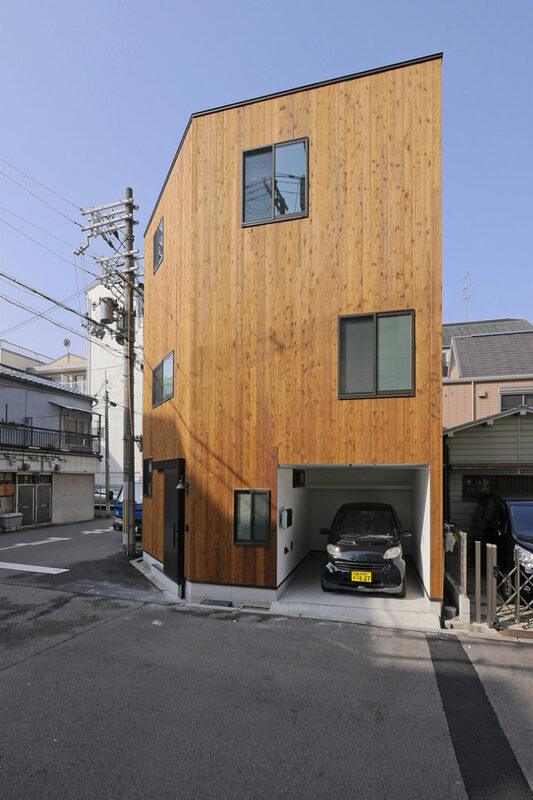 Designed by Coo Planning the House in Chiyosaki is a tall monolithic building dressed in wood with an open garage and odd-placed windows. 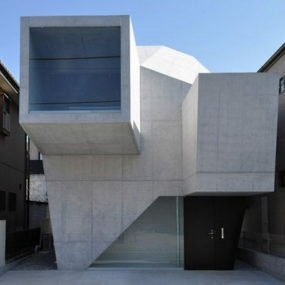 Occupying a street corner the minimal house repeats the angle maximizing the size of a small plot with multiple levels. By the way, because of a constant lack of space in the cities slim modern houses are becoming more and more popular. Vertical square footage gives more space to city dwellers and close proximity to businesses provides them with more convenience. 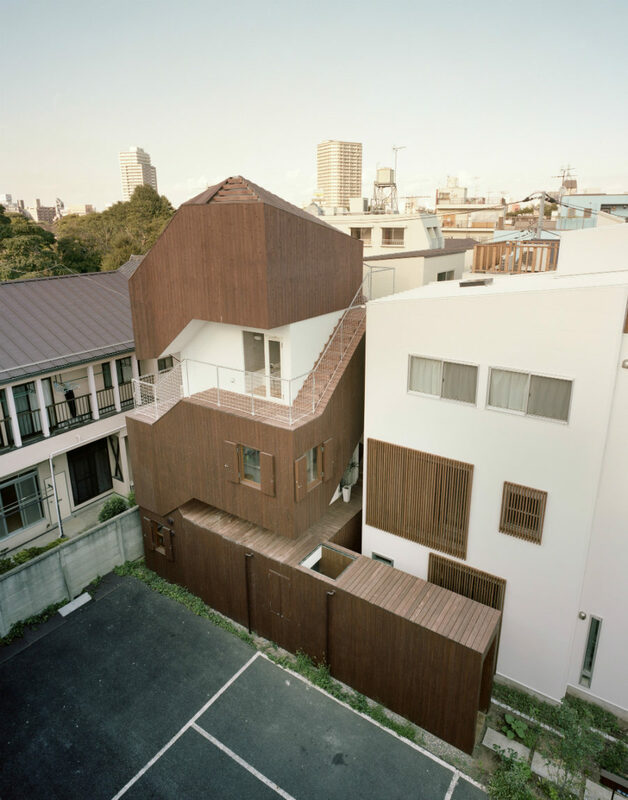 APOLLO Architects have created a Nest in Nagoya, Japan. That’s how they called a modern house built on a 355-square-foot (33 sq m) plot and featuring three levels of living space. The steel structure itself is a bit larger than that thanks to the broadening top floor. In spite of numerous floor-to-ceiling windows the house keeps its privacy with thin screens and blurred glass. 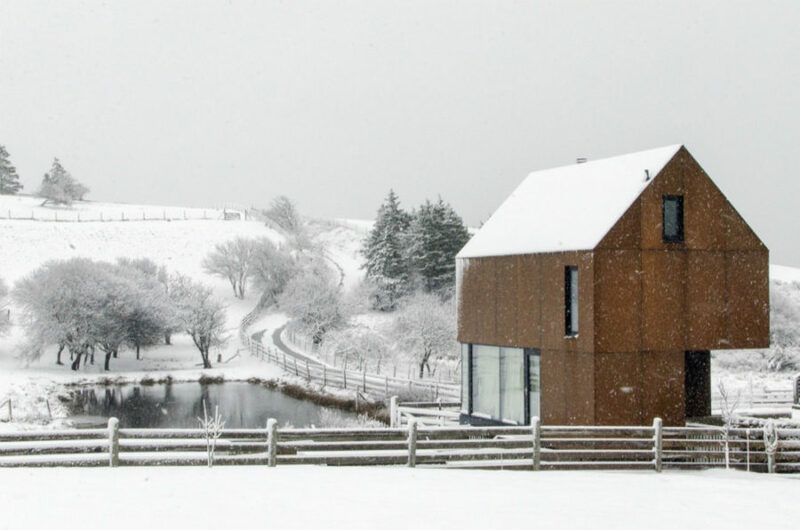 Black Mass is the work of Stephen Phillips Architects. 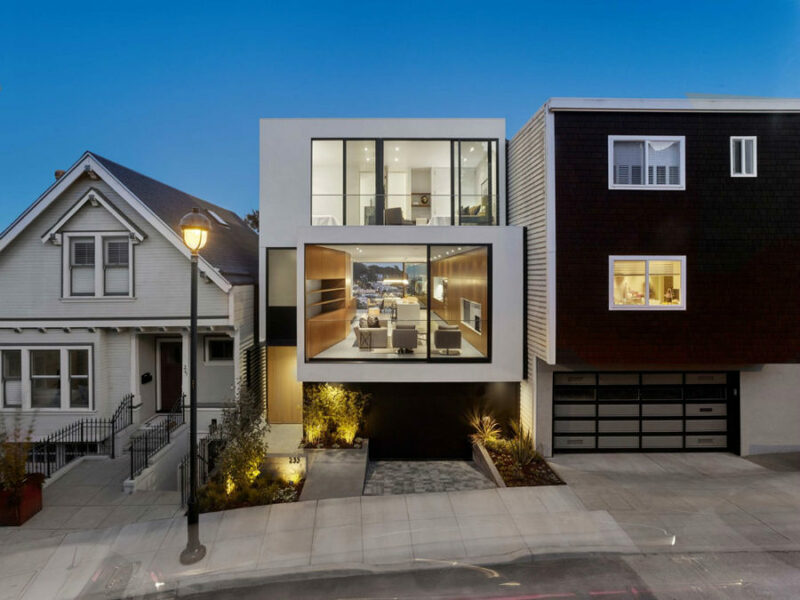 Located in San Francisco the contemporary house shares the Linden Street with Victorian and Edwardian structures. Its black exterior makes for a stark accent among lighter neutrals. A modern duplex has tremendous windows that open up to the street views. Complete with numerous glass transoms the house is filled with sunlight in every room. 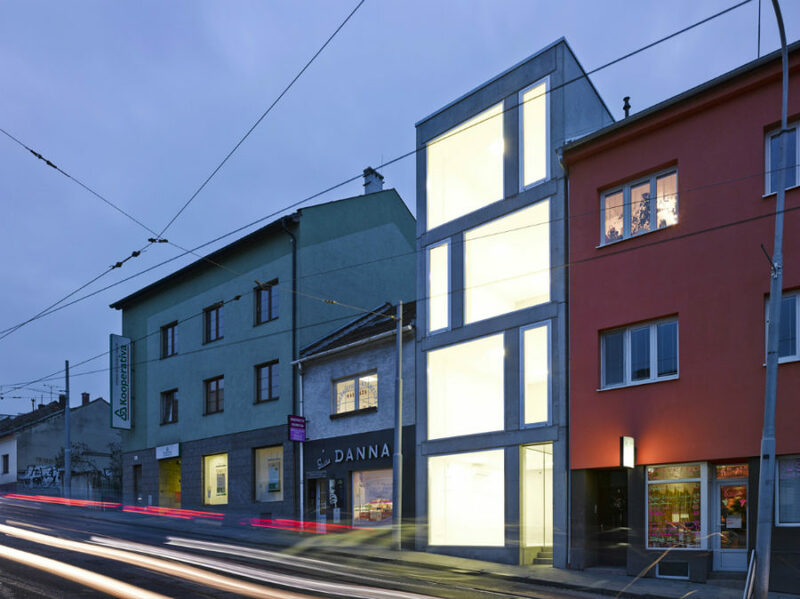 Mixed Use House by Makovský & partners located on a busy street and sandwiched between two older buildings is clearly an urban structure. 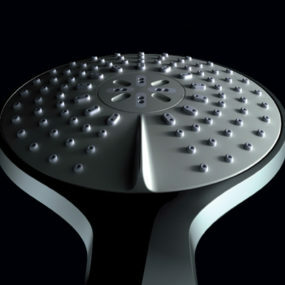 With its minimalistic style it simultaneously stands out and blends in with the environment. Four floors of the building provide ample space for living, working, or even doing business. In addition the complex staircase system in the back allows access to each level. 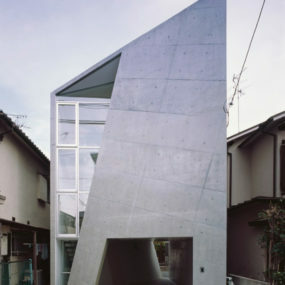 IDIN Architects did a great job on an urban modern house with a peculiar name. Completed last year the renovation project turned this mixed use building into a beautiful focal point of the street. 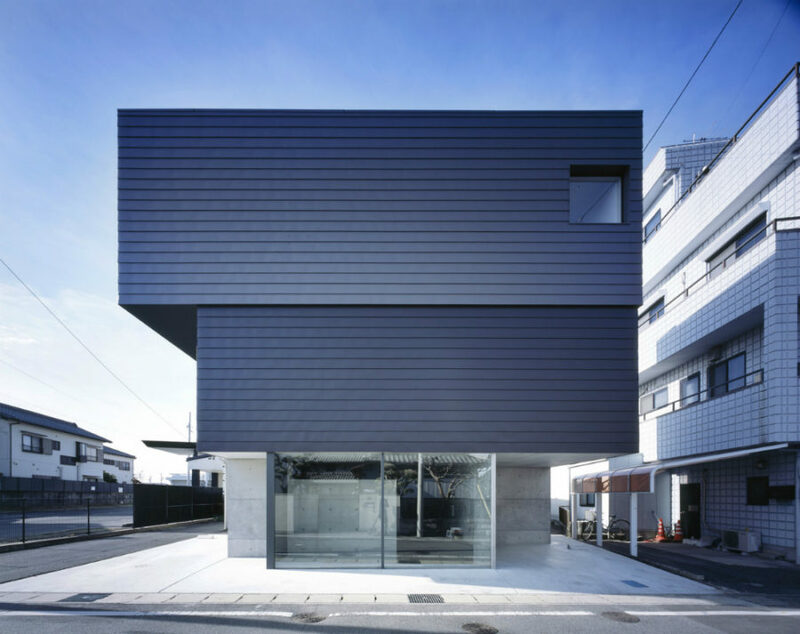 Combining an office and a house the building appears completely uniform from the outside. And its numerous curtains don’t allow even a peek inside providing full privacy for the residents. House 77 is a peculiar project of the dIONISO LAB. 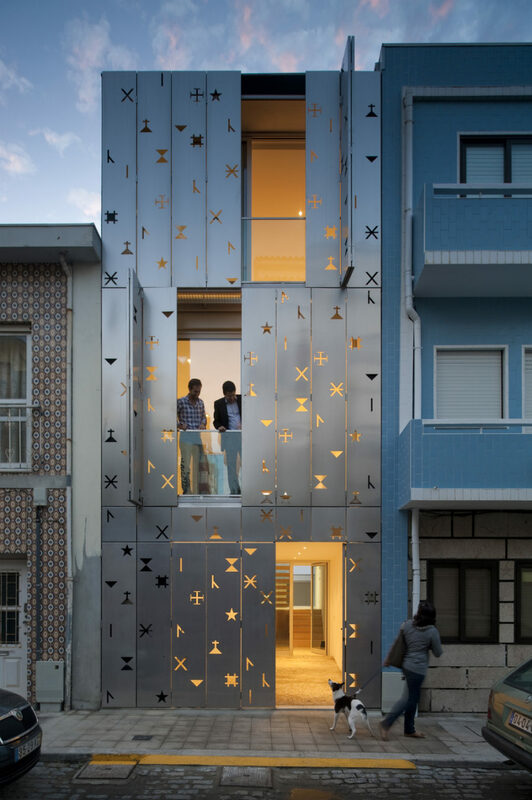 Completed in 2010 in Portugal the modern three-storey structure was hidden from the busy street with decorative stainless steel shutters. ‘Siglas poveiras’ that give them such ornamental effect are the symbols used for communication long ago. Inside, the house is pleasantly minimalist and functional. 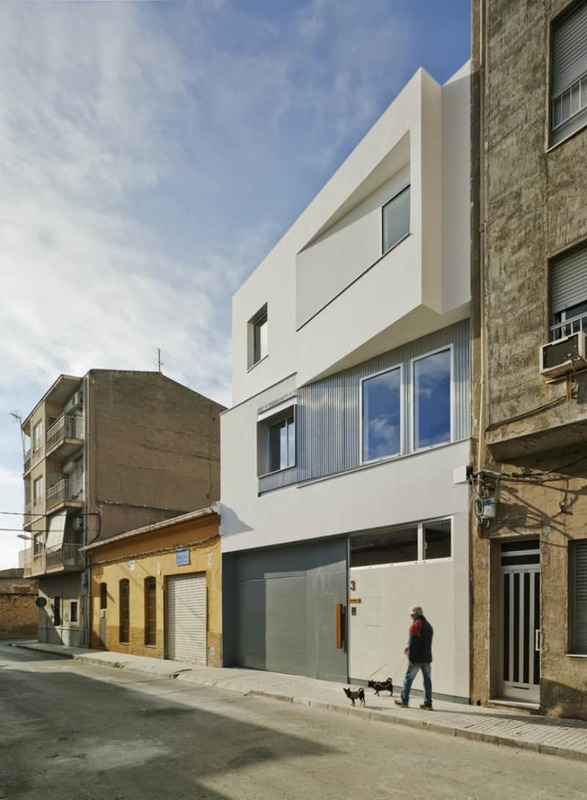 Located in Alicante this three-storey house by La Errería was built in two years and on a tight budget. The house has everything necessary for comfortable living, though. On the ground floor there is a garage space with a mini interior courtyard. On the first and second floors the living quarters were distributed across a 3,685-square-foot (342.43 sq m) area. 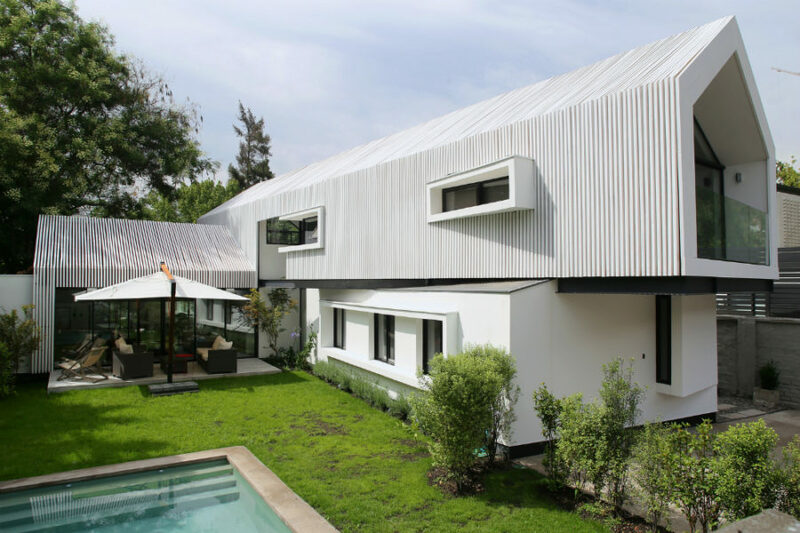 Although its facade is mostly white a panel of corrugated metal emphasizes the second floor or probably even insulates it. 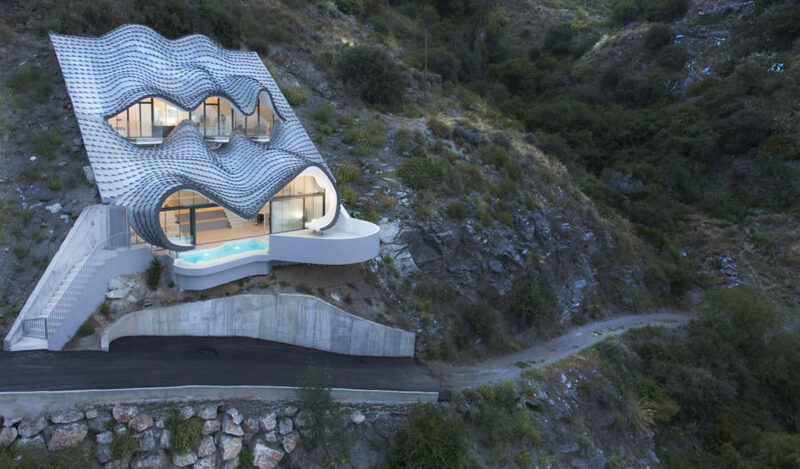 The House on the Cliff in Granada is one of the most unusual modern house designs we’ve ever seen. Due to its difficult location site it was designed as an integral part of a sloping hill. But the design concept had an additional detail that makes it stand out – a dragon scale texture. Spacious and incredibly luxurious on the inside, the house designed by GilBartolome Architects offers breathtaking sea views. No shape is forbidden in modern house design. For instance, Pilotis House in Okayama designed by Furuichi and Associates that sits near the rice fields is shaped as a cross. It is far from symbolic, though, as it was dictated by the plot size and humidity levels of the locale. Its shape does not only provide a lot of space but also promotes better air flow to battle humidity whereas numerous glazed walls harvest natural light highly required in such a vast building. Low-Energy Family House by Caraa doesn’t really look like a home at all. 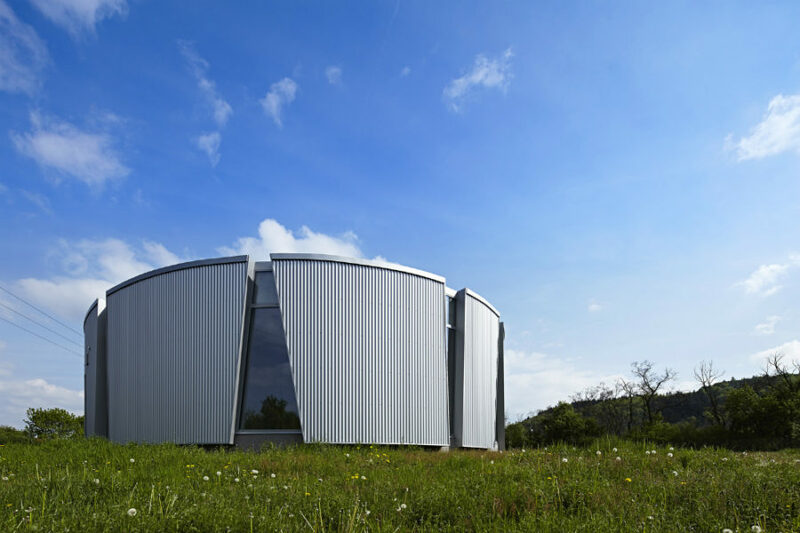 Perhaps it is because the architects rarely choose a circular shape for private projects. In case of this modern house the clients wanted to leave as minimal imprint on the natural locale as possible. Built out of concrete the house has huge triangular windows that result an curious interior architecture. 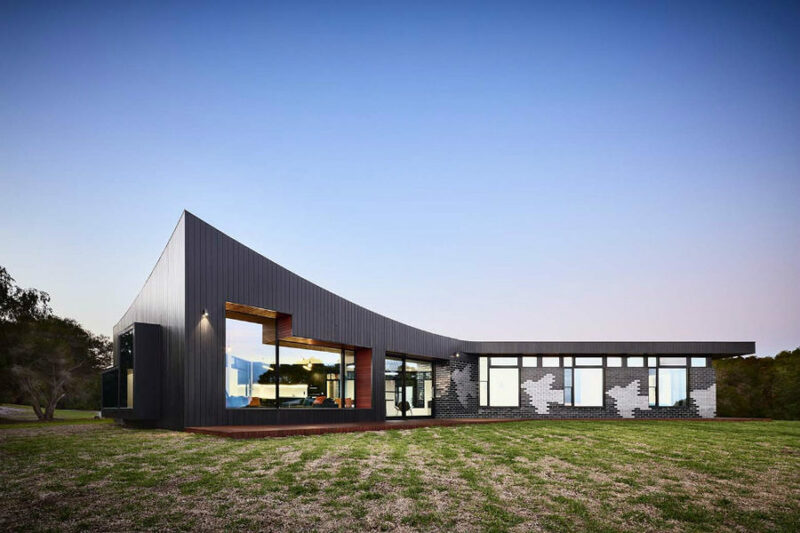 Waratah Bay House in Australia is another unusual modern house. 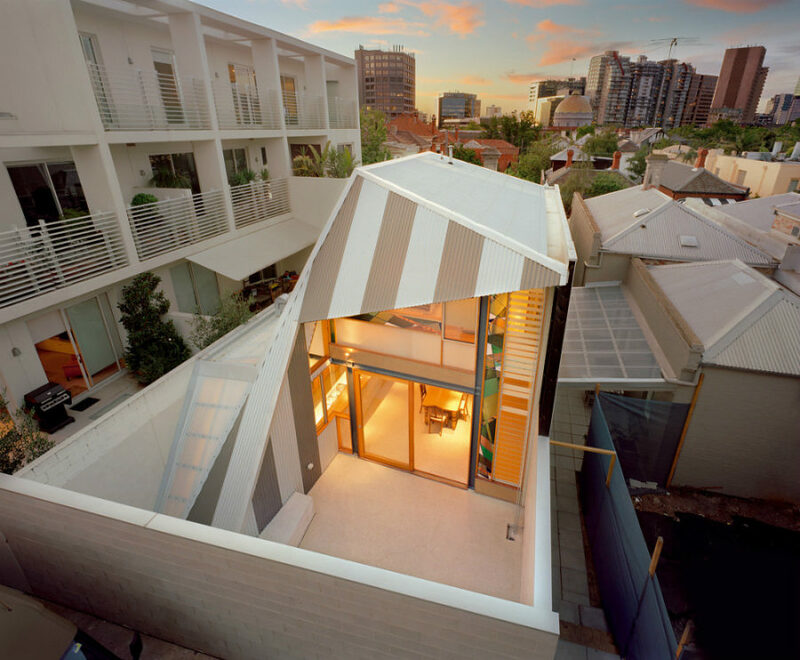 Designed by Hayne Wadley Architecture it has an angled roof soaring over the low structure decorated with tiled birds. Following the bird theme closely the house accommodates an cool angled kitchen island and shelves. In addition the house’s ventilation system comes in a silhouette of a bird decorating the living room’s ceiling. Evolution Design was given a no small task of translating all the locale’s movement into a modern house design. The resulting glass structure is sandwiched between the textured ribbon-shaped elements that extend to provide an outdoor terrace. Opening up to the Lake Zurich the Flexhouse’s glass walls soak a lot of natural light during the day. 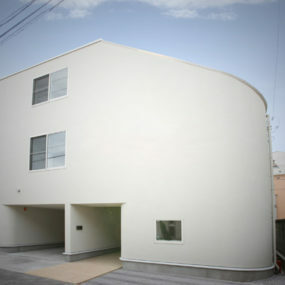 In addition, as if to complement its incredible exterior there are a lot of rounded walls and corners inside the house. 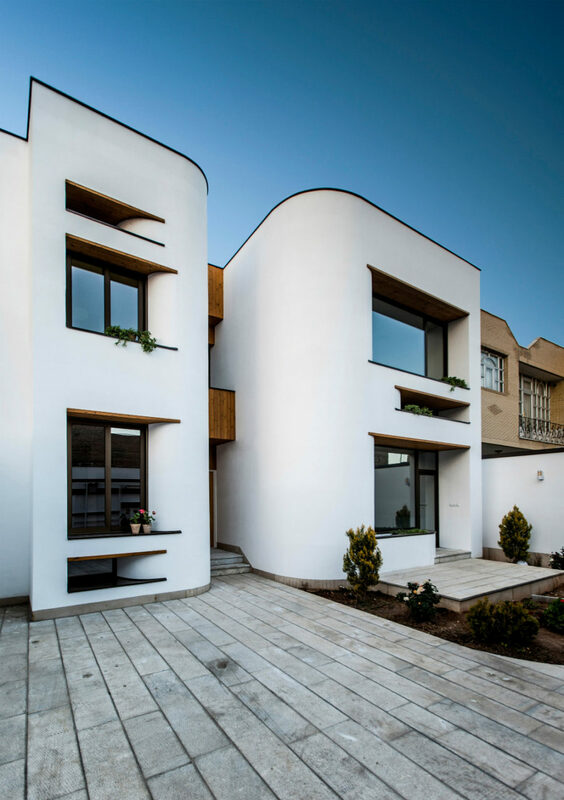 Conceived by Ayeneh Office Bahar House is an ultra modern residence in Iran. The architects divided the building into two blocks to separate public areas from private spaces. Its rounded shape does not only make the house stand out from the rest but also lends some interesting architectural details to the interiors. 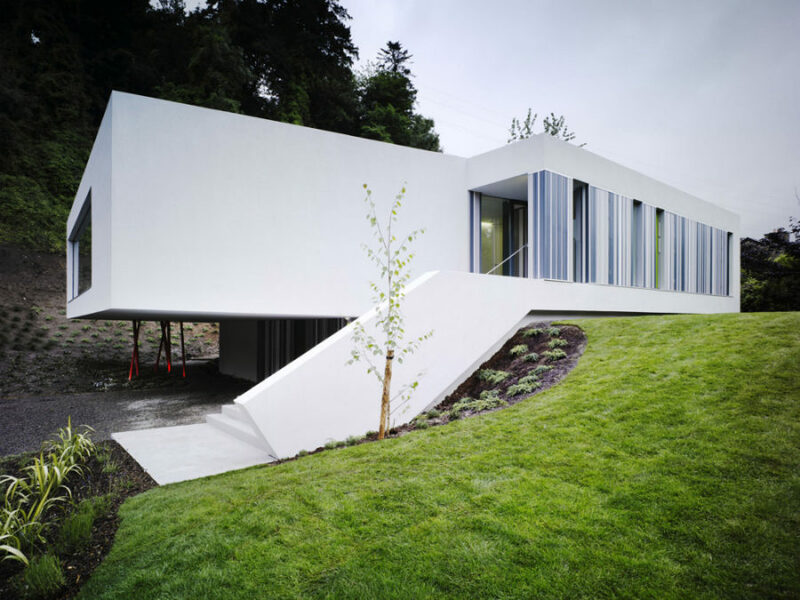 Sitting in Wicklow Hills this modern house by ODOS architects is replacing an old cottage. Offering ample living area of 3,089 square feet (287 sq m) the house has three bedrooms, a two car garage, a study, and a an open plan living/kitchen/dining area. Its intriguing shape fits snuggly into the base of a small green hill. And its road-facing side features monochromatic blue screens that add an eye-catchy detail to the pristine white building. 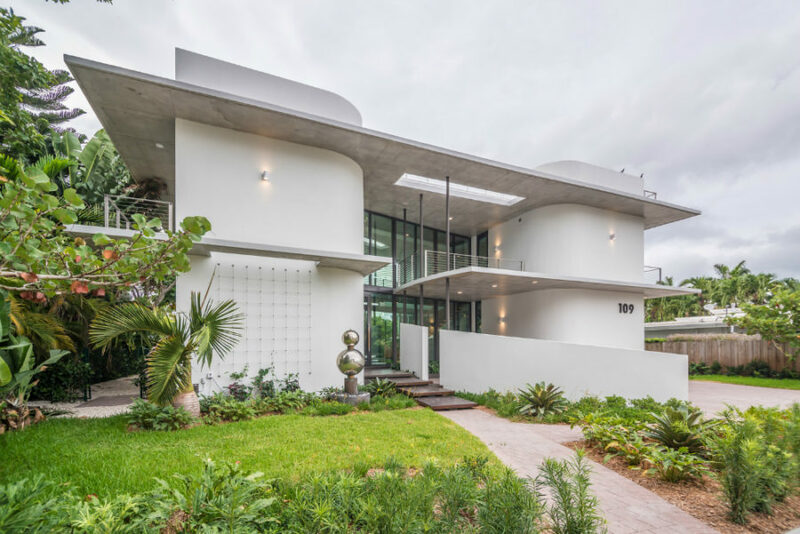 Located in Miami Beach Dilido Haus by Gabriela Caicedo-Liebert is another one of the futuristic kind. Completed this year the project follows the MiMo (Miami Modern architecture) aesthetic that combines styles Art Deco and Streamline. Resulting luxury building masterfully balances public and private spaces. And its gorgeous green landscapes further elevate the property among its competition. ZEB Pilot House – Pilot Project has a peculiar structure that can throw you off balance just by looking at it. Designed by Snøhetta as a demonstration platform for sustainable approach it certainly doesn’t lack in a wow factor. 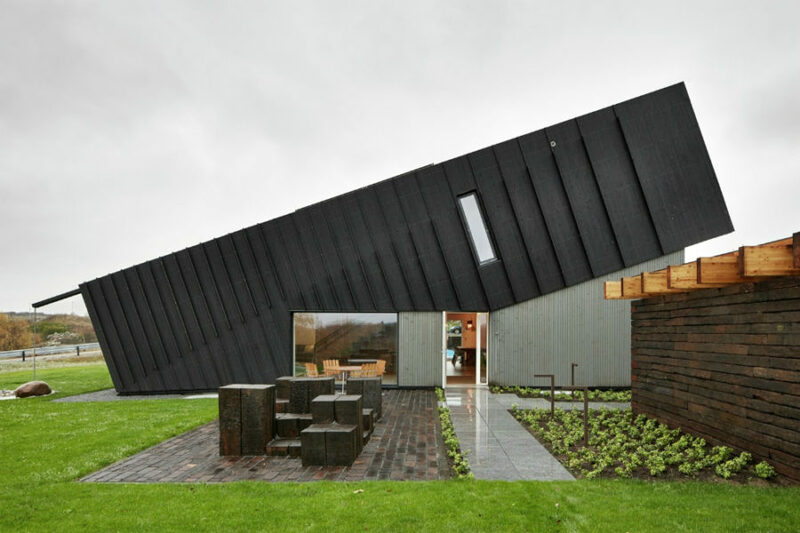 The sloping wooden block defines the exterior creating a feeling of whacky sloping interiors. But on the inside it looks very normal and even cozy instead. Gaze is one of those structures. It catches the eye and combines various materials and elements to maximize space. 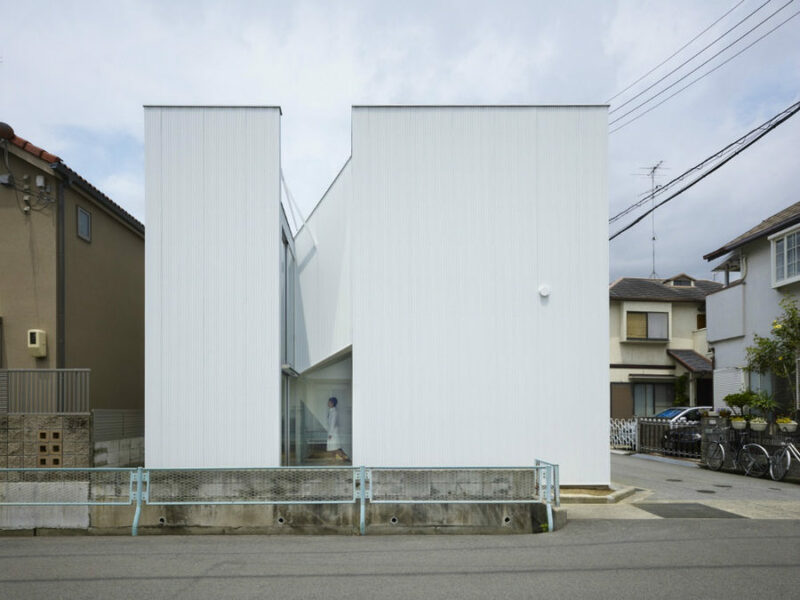 Created by APOLLO Architects for a client with an art collection Gaze is almost completely hidden from the outside world. Glass walls on the ground floor are obstructed with concrete interior walls that don’t only increase the privacy of the house but also offer precious wall space for hanging art. 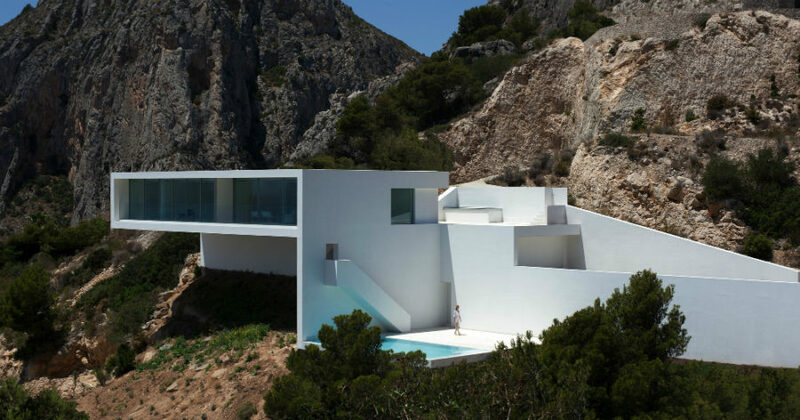 Another House on the Cliff is the work of Fran Silvestre Arquitectos who love the challenge of “constructing a house on air”. Located on a difficult site in a small Spanish town of Calpe the modern house boasts an airy design that proves that the architects are up for that challenge. 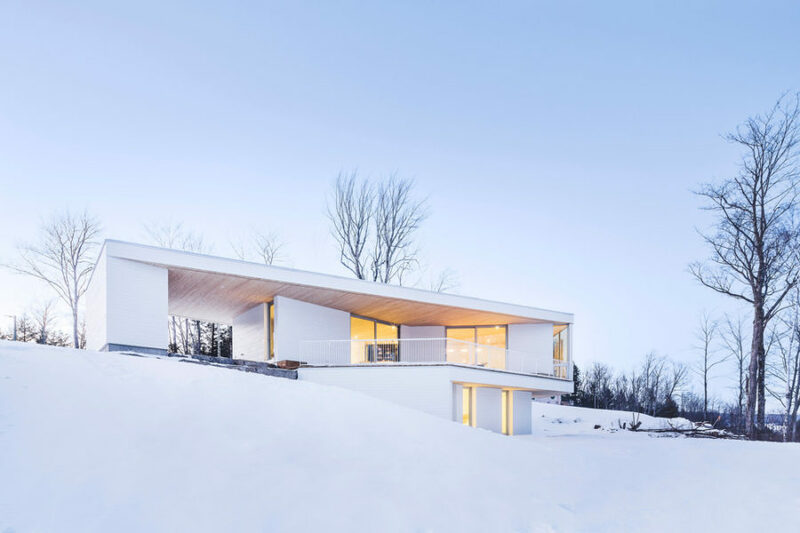 Using mountains as a picturesque backdrop the white geometric abode looks like a proper celebrity retreat. Nook Residence by MU Architecture earns its name through its pavilion-like design. Partially hidden behind white wall the living spaces share the stage with the sleek outdoor spaces. Plentiful glass inclusions offer the views and access to those outdoor areas as well as harvest the natural light. And even the facade mezzanine can’t prevent dwellers from enjoying the landscapes thanks to the wispy thin railings. 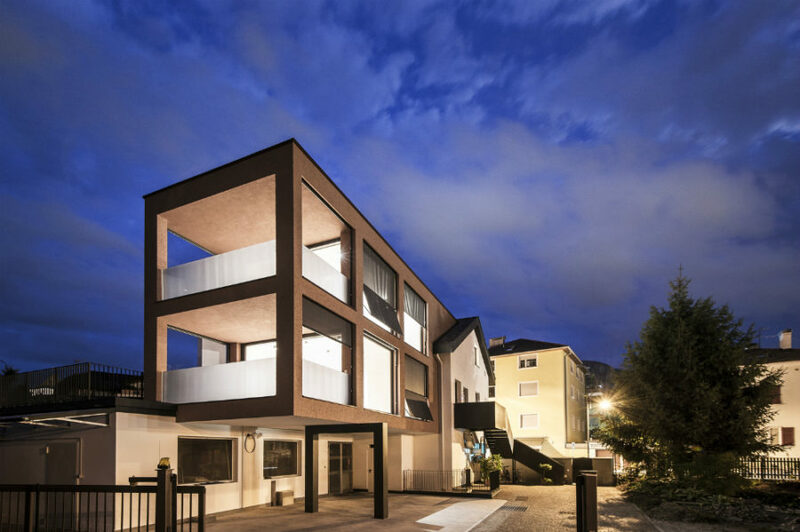 Grünberger by noa* is a modern house in Bozen, Italy that seamlessly completes an existing traditional home providing residents with more living space. Enhanced with spacious open rooms it boasts a row of huge windows that opens up to the views of vineyards. Pavilion-like buildings are amazing for picturesque locales because they create a natural indoor/outdoor feel. Guazuma House by Alberto Zavala Arquitectos is such a building. Because of its wide narrow structure without walls it only partially protects the living area from the outdoors with the sliding glass doors. The areas at either side of the living room are almost completely open to the environing nature. Though more private areas are hidden at the back of the house in elevated boxy structures with staircase access. Modern house designs have a lot to offer to a modern dweller. There’s a ton of space thanks to the open indoor/outdoor layouts, unusual shapes and angles, cutting-edge materials that can help reduce energy consumption. 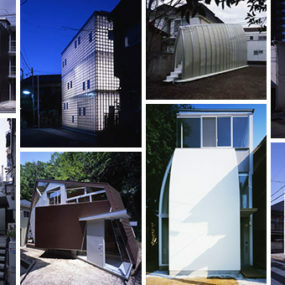 Finally, the modern house architecture does not restrict creative minds in any way. Anything that can be imagined can be built, if you can afford it that is.